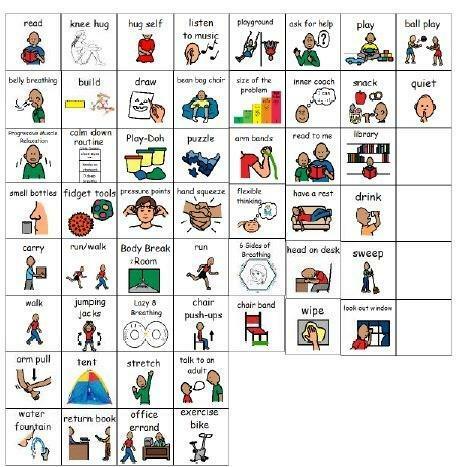 If you require more information about using visuals to support your students' self-regulation, please contact Andrea Wilson, Occupational Therapist, or Andrea Flesher, Inclusion Support Teacher, at Student Services: 250-339-0971. 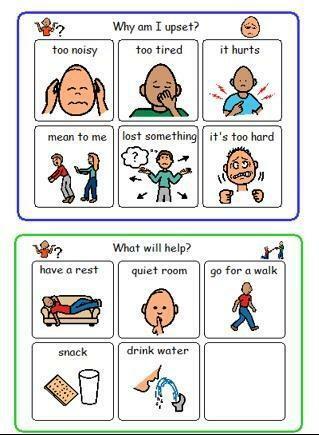 Use this visual support with students to identify the way they are feeling and then to select a choice that will help them calm down, focus or get back on task. I can choices can be selected from the all self regulation choices or they can be customized. Select from the 4 common feelings listed, or select the blank option to add your own picture/ photo and emotion. Role play with student and take a picture of the emotion. - Why am I upset? Customize based on student's triggers and personal self-regulation tools (#8). 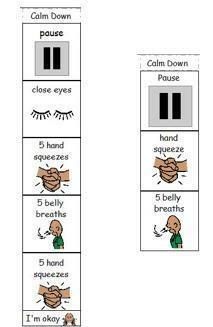 This routine is used to help students calm down across environments. It is a tool for the ​body. 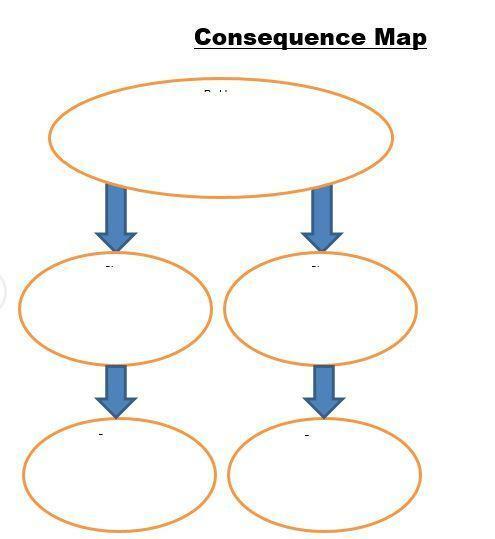 Depending on student's ability to make choices, use either predetermined activities (left example,) or select self-regulation tools (#8) or create customized tool pictures for individual students (right example). Used to prompt a student to take a break or for a student to ​request/ indicate their need for a break. 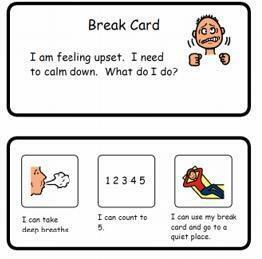 Used to help a student gain awareness of whether they need a break. Review tool options and decide which are best suited to your student. Tools may be help your student self-regulate at the level of their body (i.e. sensory), heart ​(i.e. attachment/co-regulation), and/or mind. Some tools can be used anywhere and any time. Other tools will require your student to leave the classroom. Belly breathing is a tool for the body that promotes activation of the calming response (via the parasympathetic nervous system.) Practice belly breathing with both hands over the navel to be sure the diaphragm is moving with each breath. The belly should expand with each inhalation and collapse with each exhalation. Heavy work is a tool for the body. Put this visual on your student's desk to illustrate some heavy work options that can be done while seated. 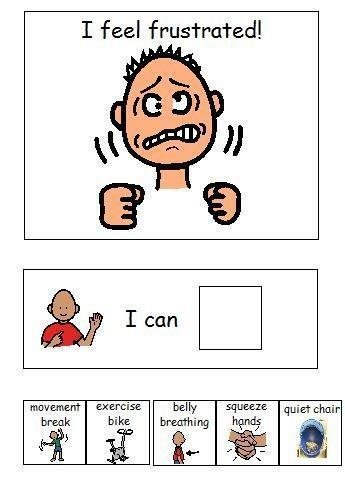 Use this visual to remind your student of some mind tools they can use for self-regulation. Be sure to ​explicitly teach each strategy before using this visual support. To teach/implement size of the problem (a mind tool), refer to Zones of Regulation Curriulum pages 122-126. 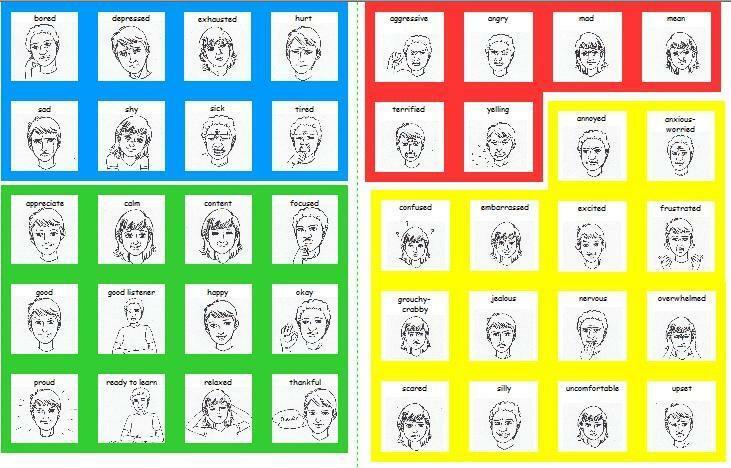 Display these at the front of the class (after introducing/practicing each) and use them to prompt students to engage in independent self-regulatory activities for the body and mind. 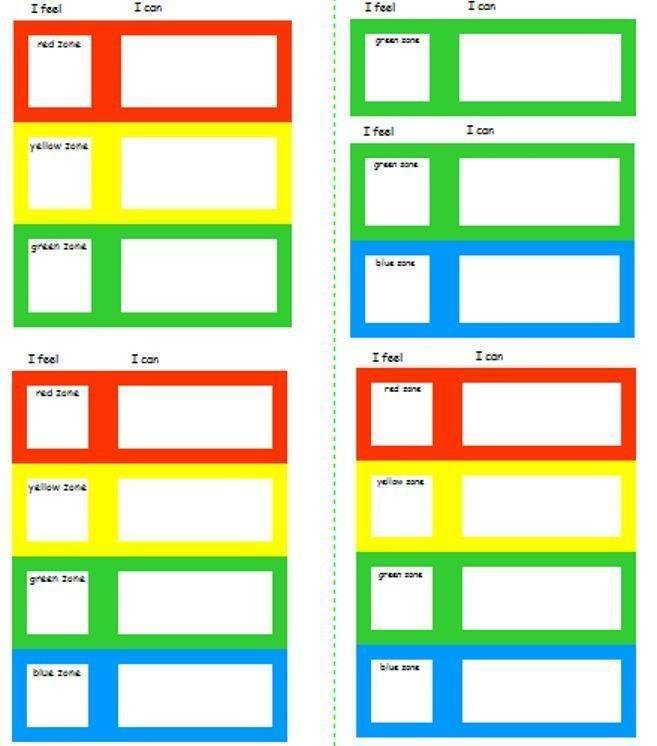 Tape this strip to each student's desk to provide a visual reminder of self-regulatory body tools that can be used while working. This scale a tool for the mind. 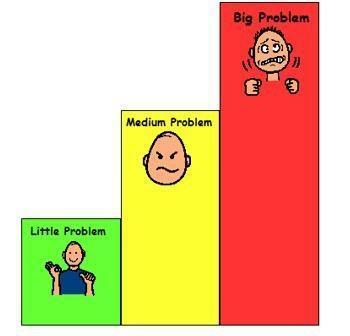 Use this 0-5 scale with a student who struggles to identify/manage frustration/anger. First, discuss what each level feels/looks like (for that student). 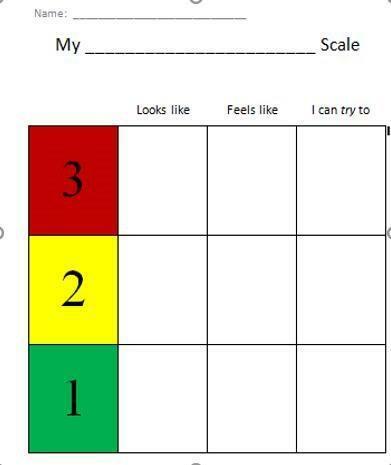 Then, use the scale as a visual prompt to identify what level the student is at (focusing on levels 0-2 to begin.) Please be aware that this tool may not be effective if the student is at level 4 or 5 (because thinking abilities decline during extreme stress). 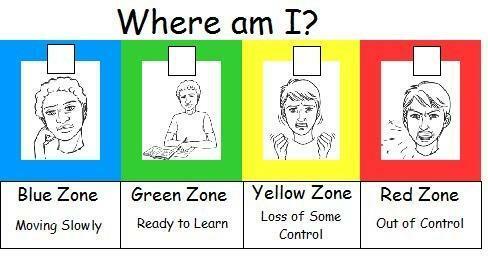 ​Use this visual support with the Zones of Regulation program. Select from All Self-Regulation Tools (#8) for the I Can column, or draw/list regulation tools with a wipe-off marker. Use this 3-point scale to help your students understand their usual patterns of nervous system arousal (i.e. elevation). First, work with your students to determine the external and internal signs of their elevation. Record these in the looks like and feels like columns. Then, decide on some tools that could be helpful at each stage and record these in the I can try to column. Tools at level 1 will help your students stay calm and ready to learn. At level 2, include tools for the body (i.e. sensory), heart, and mind. Be sure that several tools can be used anywhere and any time. At level 3, your student may simply go to a "safe space" to de-escalate. Mind tools will not be effective at this level. Use this 5-point scale to help your students understand their usual patterns of nervous system arousal (i.e. elevation). First, work with your students to determine the external and internal signs of their elevation. Record these in the looks like and feels like columns. Then, decide on some tools that could be helpful at each stage and record/illustrate these in the I can try to column. Tools at level 1 will help your students stay calm and ready to learn. Beginning at level 2, choose tools for the body (i.e. sensory), heart, and mind that will help your students return to a calm and alert state (i.e. level 1). Be sure to choose some tools can be used anywhere and any time. Tools for the mind will not be effective above level 3. At level 5, your student may simply go to a "safe space" to de-escalate. 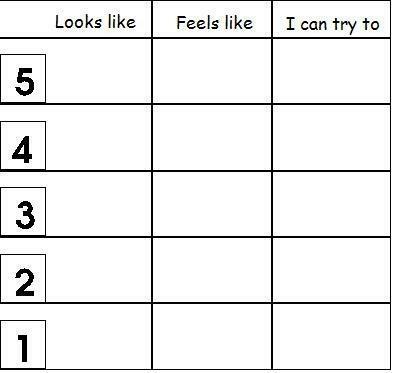 Use this 5-point scale mind tool to help your student understand his/her usual pattern of nervous system arousal (i.e. elevation) and follow through with self-regulation tools. Customize the feeling pictures in the I Feel column to represent what happens for your student. 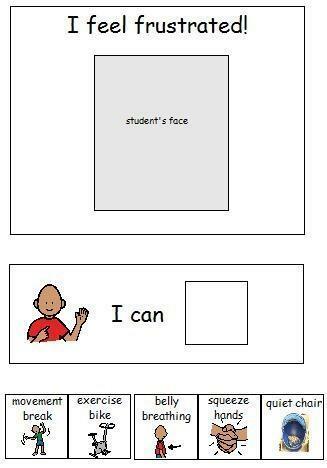 Similarly, customize the I Can ​pictures with self-regulation tools that your student responds to at each level. Email the Student Services Technology Department for support with customization. Customize this Zones of Regulation visual with your student's most frequent blue, green, yellow, and red zone feelings by printing I Feel Images (#22) or emailing a request to the Student Services Techology Department. ​Use these simplified Zones of Regulation visuals to teach your students to identify their zones and choose/use effective self-regulation tools. 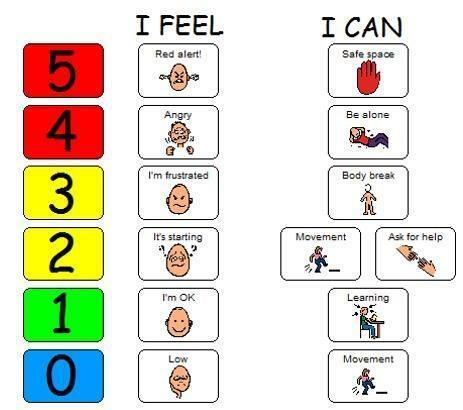 These visuals were designed for students who are just beginning to identify feelings. First, introduce only the green zone with 'happy' in the I feel column. Choose one or two tools for the I can column that help your student stay in the green zone. 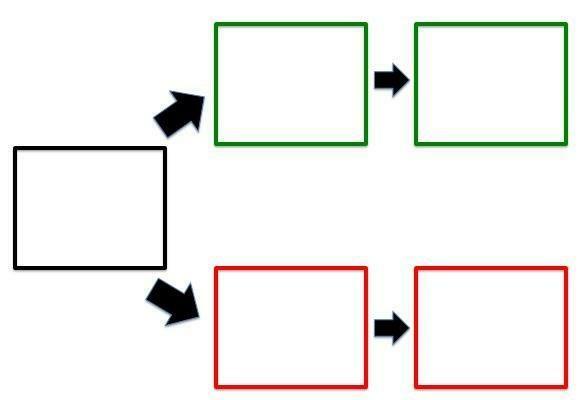 Once your student is able to identify when they're happy and use their green zone tool(s), introduce the blue zone with 'sad' as the feeling (using the green/blue visual). Once your student is able to identify and differentiate happy/sad and use effective coping tools for these two zones, introduce the yellow zone, choosing whichever yellow zone feeling occurs most frequently for your student. Introduce the red zone in the same way. For I feel visuals, choose from I Feel Images (#22). For I can visuals, choose from All Self-Regulation Tools (#8). NOTE: Print 'Change' page on transparency sheet. 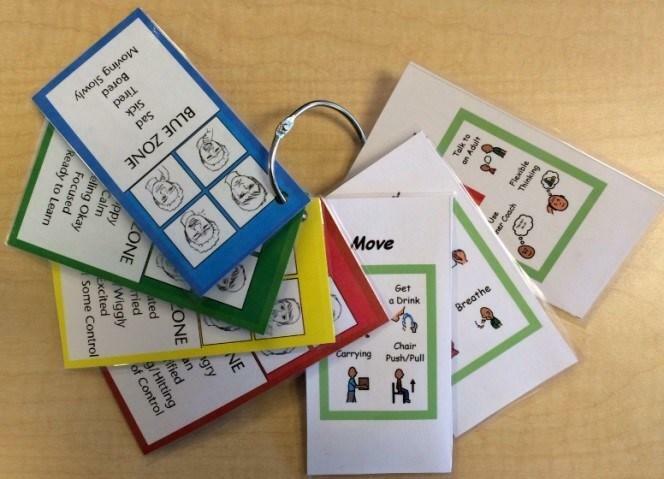 This key ring can help students identify their zones and choose tools for self-regualtion. Please note that 'move' and 'relax' tools are all tools for the body. ​Also, there are no heart tools included in this visual support.